"This book is for walkers with a liking for long distance 'unofficial' expeditions"
After having spent the night in Richmond, a town we will pass through later in our journey, we have taken the Sherpa van mini bus west to the start of the trail at St Bees. Our unofficial expedition is about to begin, all we have to do now is walk back! Last night we had a taster of what to expect over the next few weeks, even before we had started. We met 3 guys who had set off from St Bees on June 3rd and were having a second rest day in the Wetherspoon pub. From what they told us they already had quite an eventful few weeks as they made their way to Richmond. Lizzie was tucking into her dinner as they jokingly suggested that it looked like she was eating her final meal before being sent out into the wilds! Like favourite uncles they scared Lizzie with tales of blisters, big mountains, getting lost, 12 hour days of walking and people cheating on the way by using taxis to miss out the nasty parts. Along the way we will inevitably meet others. 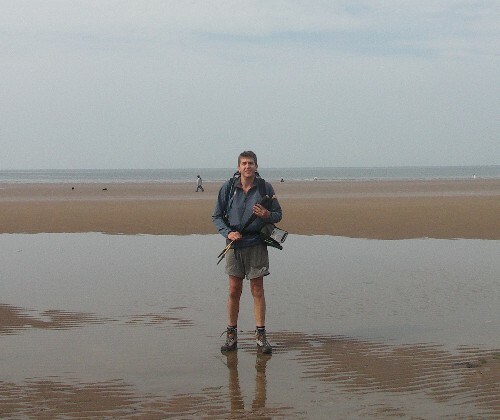 Some like us using the baggage companies that also cover the route, some on guided trips, others backpacking, solo or with friends and partners, but all ultimately heading towards Robin Hood Bay in our own little window of time. Of course there will also be people doing the route in reverse - east to west. In some respects this passage of people reminds me of the film Emperor's Journey where each year the penguins embark on a journey back to their birth place. Thankfully our journey doesn't have quite the same dangers or life and death consequences as theirs. Nevertheless here we all are, a collection of people all heading towards the same ultimate destination and with our own particular reasons for doing so. On a personal level I am really looking forward to this little adventure, sharing the experiences with Liz, the highs and lows before hopefully completing the journey that I started alone 25 years ago. During our day walks I have been surprised by Lizzie's determination to keep going over long distances and through adversity even though her little legs do not appear to want to go anywhere and at times her fixed grimace looks like each little step is painful. That in turn has made me more determined to carry on even when the voices inside my head are telling me to stop! Its a pity that this determination to complete something does not quite extend to completing DIY jobs. So our journey across England from one coast to the other has begun! The words of Supertramps - "logical song" - are playing around in my mind and probably for one of the few times during the next few weeks the direction we should be taking appears to be quite obvious. Water on one side, land on the other. So why is Lizzie heading off towards the sea and Ireland? Coast to Coast tradition has it that you dip your boots in the Irish Sea and then pick up a pebble from the sea to take with you to deposit at the journey's end at Robin Hoods Bay. 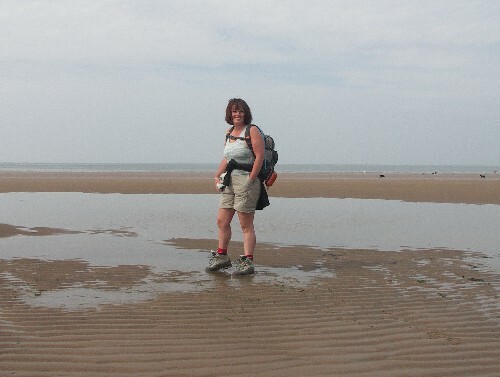 We dutifully dipped our boots in a little bit of the Irish Sea, just for luck I have added a few extra pebbles in Lizzie's rucksack. Recently on our day walks she has been overtaking me on some of the hills so the additional weight should even things up a bit! The bonus being that if she doesn't find them in the next few weeks we can build a new rockery when we get home. Tradition where Lizzie and I are concerned seems to always dictate that a walk should start with uphill. This one is no exception so here we go again with a climb up the coast path on to the top of the cliffs at St Bees Head but just before that we had asked someone to take our photo. 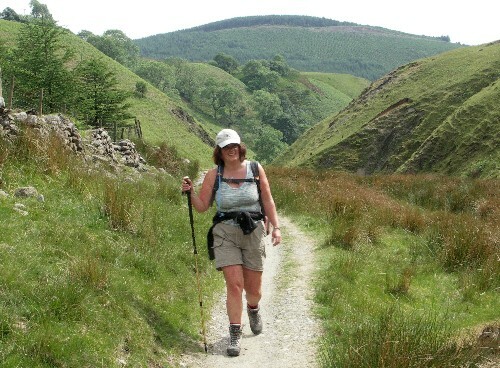 We'd noticed this lady waving off a heavily laden walker, Nigel, she told us, is doing his third crossing. Judging by the pack he was carrying it looked like he was leaving home! 'You will soon catch him up' she said, not likely! Nigel was off like a train. The only way of catching him would be if he had a 3 hour lunch break! He popped over the coves along St Bees Head - never to be seen again. We eventually did catch up with Nigel and his 50lb load in Shap a few days later, at the end of a very wet day, by which time he had become a legend. ' Have you seen the guy carrying the huge rucksack?' was almost the first question everyone asked when we met them. 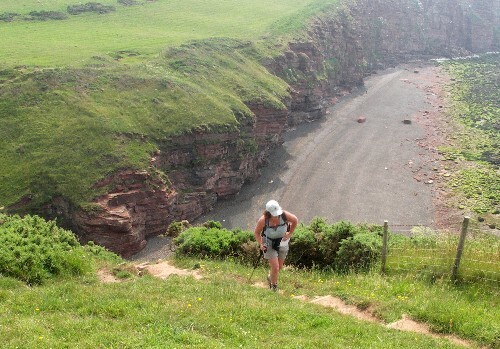 St Bees Head is known for a number of thing, not just the start of the C2C. There is a large RSPB sanctuary here with many nesting breeds of sea birds. The cliffs are also popular with climbers who work closely with the RSPB to conserve the area, restricting climbing at certain times to ensure that the nesting birds are not disturbed. A good example of 2 separate groups with completely different objectives working together for a common cause to help protect the environment. No time for hanging by our fingertips today though, we have to press on. St.Bees Head is also known for the view - of Sellafield Nuclear Power Station! Was that a three headed seal swimming backwards down there? It has had a name change in the last 25 years from Windscale in an attempt to make it more 'consumer friendly' but we know that it is the same place that came within a whisker of blowing up in the 50's and taking most of the north west with it. The view has changed slightly but I expect the inherent long term dangers to the environment are still there. At one point walking along the coast path it was so quiet, peaceful and calm that it almost seemed possible to hear the Earth spinning, or maybe that was just Kev's head still suffering from the night before! The path soon swings away from the coast heading towards the distant hills of Lakeland, everything was going well except for a little drizzle now and again but on the whole a good day for walking. Things started to get a little serious with a long climb up onto Dent Fell, great views back to the sea, across to Sellafield and ahead, the Lakeland hills. This was the first time that we got lost, strolling up through the forest, we were too busy concentrating on the main track, that we ignored a tiny path going up to the left, which led to Dent Fell. A very kind man, coming down the path, saw us go wrong and came chasing after us to tell us. Careful consideration of the map we still couldn't see where the path went left though - looked like a nice straight path all the way! We found out later that we were not the only people to go wrong there - one bloke carried on and found that the track led to a village - he was given directions back to the start of the track and had to climb it all again but somehow found himself going round in circles much to his frustration. We learnt later that one person had died the previous week going up Dent Fell in the heat, which was very disconcerting, luckily we had a cool day but it was still tiring. Lizzie started to feel the strain a little after a very steep descent at Raven Crag (not helped by the fact that her boots had started rubbing badly on her ankles) and we had that awkward feeling that we might actually be lost which made the long steep descent we were heading down even more uncertain. Luckily when we reached the bottom we realised that we had been on the correct path all of the time and having confirmed this with the GPS started to head towards Ennerdale Bridge, our final destination, along a very scenic valley Nannycatch Gate. 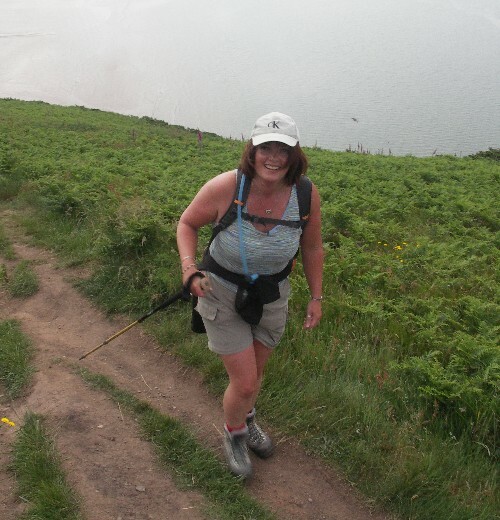 Then, having done the difficult steep downhill, bit Lizzie fell (her boot laces on one foot had somehow managed to catch on her other boot, so effectively lassoing her and causing her to fall over) - straining her arm as she landed making it a slightly uncomfortable final few miles. Normally Lizzie manages to fall when going downhill but this time waited until we were on a flat path. The good will that we were to discover in later days hadn't set in yet as two women quickly strode past Lizzie without stopping or even slowing down to find out if she was OK! They kept their faces carefully averted, obviously hoping that we would not stop them to ask for help. A fell runner however stopped to make sure everything was ok.
16 miles (25 km) and 6 hours after setting off from St.Bees we finally arrived in Ennerdale the distant views revealing the hills we would be heading towards tomorrow, but it was still a good 2 mile trek out of Ennerdale Bridge to the Guest House in Kirkland where we could finally put our feet up and soak in a nice hot bath. The guest house owner had recommended a local pub for dinner and offered to drive us (and the 2 other guests) one way, either to the pub or to bring us back as it was a slight trek. Having asked whether the trek was up hill or down hill, we were reassured that it was flat and only 0.9 miles away. We opted to be driven there and make our own way back - the length of the drive made us somewhat uncertain about the 0.9 miles though - on the walk way back we passed a sign saying Kirkland was still over a mile away - nor did it seem that flat! As to the pub itself, The Lamplugh Tip, all we can say is that it is very aptly named and judging from the two girls serving the tables the place is doing all it can to increase the nations cholesterol and sodium intake. Unfortunately we needed to eat and with nowhere else to go we had no choice but to eat there. At least they had a veggie option - a butter bean casserole heavily laced with salt and chilli that probably had less than half a tin of beans and a few thin slices of celery in it yet still managed to command an asking price of £8. Lizzie had the leek and potato soup, which although filling, was again very, very salty. Veggies on Tour! Looks like we might have food problems in the days ahead!